Colleague is not just a person you work together. This is the person who’s always ready to help and cover for you, who is always ready to listen to you and discuss pressing issues. And we start to realize how important our co-workers are only when they’re missing. Let your distinguished colleagues know that you miss them and seek to see them happy and healthy at work. Provided in this section, get well messages for colleague will express your care and good attitude towards the ones you work together. 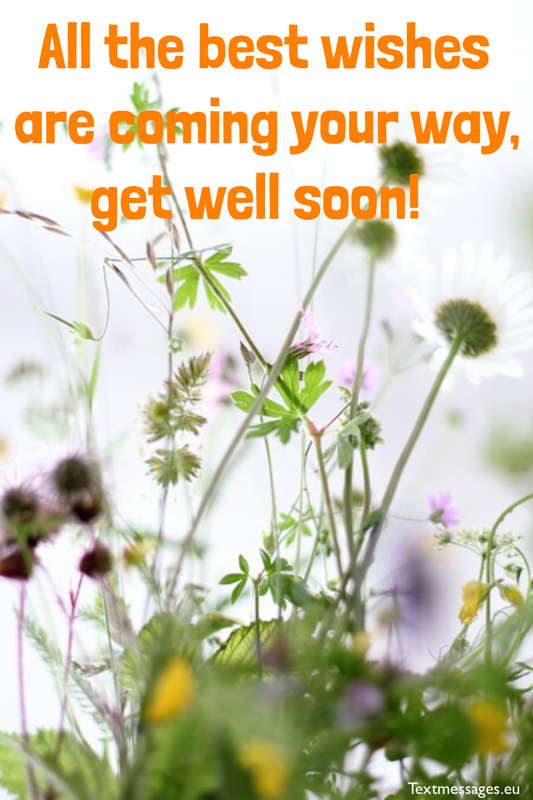 All the best wishes are coming your way, get well soon! We know that you’ve been sick for a while and now you need to recover. Take your time and don’t worry about a thing. We all are waiting for you to come back! You need to hurry and get healthy, otherwise someone new will take your place! It’s already happening! Boredom has come to our office, because the most cheerful man there got sick. Please, come quickly and get it outside! Dear colleague, don’t worry about your work matter or something left unfinished. I will take care of it. But in return you have to promise me that you’ll try your best to fight the disease and get better! You always were able to inspire me to continue working in the hardest times and if something went wrong you always were by my side ready to help. I really appreciate everything you do for me and now, when you’re sick, I feel like I need to support you somehow. Get better! There are some people who are able to cheer up even when you have a very bad mood. You’re this kind of person and now when you’re sick, I really feel that someone very important for me is missing. Please, get well! Guaranteed cure from any disease is a good night’s sleep. And now you have a really good opportunity to sleep as much as you wish. Get well and come back to work, because we start to miss you! It’s better to stay at home in the warm bed than to work hard from dusk until dawn, but what is better than all of this, is to be healthy and feel fine. I wish you to get well and forget about being sick. We have so much work to do that sometimes start envying you, enjoying yourself at home. But then we think that you might be feeling really bad, even worse than we are. So get well! I know that now you’re relaxing and having time on your own at home, but something bad has happened at work. We started to miss you so much! And you’re the only one who can fix this situation. Please, get well and come to us! Every disease means that your body has weakened and needs a total reset. I wish you to have a good rest and a proper treatment so you could gain strength and recover. It will help you to explore new career territories, when you come back! I know that you feel bad at the moment, but there’s one thing that is worse than your disease: it’s the fact that I feel so lonely at work without you. I hope that your disease will fade very soon and you’ll become healthy again. Want to tell you something. I work because of two reasons: earning money and you. And now, when you’re sick, I have only one reason to go to work. If it goes on this way, I’m afraid I will lose all motivation and hope, so please get well and come to work! You’re the heart of our work team and now when you’re sick, we really feel that we lost our soul. Even the work doesn’t bring us pleasure as before, when you were with us. Please, get well as soon as it’s possible, because we miss you terribly! Not much is going on at work without you. I have no one to talk to and drink coffee with on breaks. I hope that you’ll get better soon and come back to work and me! You don’t have time to be sick, because the world outside is amazing and it’s waiting for you! You just have to try a little bit and you’ll feel better very soon! When we were small kids we liked to pretend that we were sick in order not to go to school. And now, as we are grown-ups, sometimes we still don’t mind to catch a mild cold and stay home for a few days. Anyway, get well! Sometimes it’s good to get sick to see who cares about you and who doesn’t. It’s a test not only for you, but also for those who are next to you… I hope your friends and family are very caring and owing to them you’ll feel better very soon! Staying in bed all day long, watching films, enjoying yourself… A description of a perfect day! Being sick is not that bad… But it shouldn’t take too long, because being healthy is a lot better than being ill! Get well! Until you feel well once more. Being sick is a good opportunity to take some time away from work and make sure once more that everybody loves you and cares about you a lot. Enjoy yourself and relax a little bit, your work’s not going anywhere! We have always appreciated you as our colleague and as a person, but now that you’re not here we realize that you are completely indispensable to us. Get well and come back to us, we miss you very much! You must admit that being sick is not that bad… You have so much time on your own and can do whatever you want. But still I wish you to get well, because we all miss you very much! There are so many good reasons to get well as soon as you can. First of all, your friends and family. They eager to see you healthy and happy. Then, your colleagues and boss. They appreciate you so much! And finally, you have to get well for yourself, because nobody enjoys being sick! It’s so awful to get sick when there are so many things to do! But don’t worry, because the good news is that now you have enough time to get rest and gain strength to finish old things and start new ones. Get well soon! We wish you lots of health, and we hope that you recover as soon as possible, we miss you here, get well soon! and be back on your feet in no time! we wish you luck, and get well soon! we hope you like it and get well soon! Sunshine, water, exercise, rest, diet and fresh air. These are the best six doctors that anyone can have. Hope that they will attend you, ease your mind and make you feel better.